It seems unlikely that Michael, age 14, traveled alone. We think he may be the Michael (Michel) reported on the same ship log with Joseph Kunshier Sr., his father's cousin, and Joseph Kunshier Jr. (Joseph Kunshier Sr. is the author's great grand father) The ship was the S.S. Nurnberg in the North German Lloyd line. They sailed out of Bremen and arrived in the Port of Baltimore on October 15, 1884. It is possible that all three headed to St. Paul, Minnesota where Joseph Sr.'s sisters; Anna Kumshier Irber, and Theresia Kumshier Wiedl, had settled about 10 years earlier. Anna had married Andreas Irber in Bohemia in 1864. Andreas was employed in the grocery trade, later owning his own store. 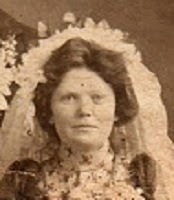 Theresia had married Andrew Wiedl in St. Paul in 1875. In the 1888 St. Paul City Directory, Andrew Wiedl's occupation is listed as mason. In other words, Joseph Sr., had two siblings who had successfully established themselves in America. This provided a destination with a good chance for success. Joseph Sr. didn't stay in St. Paul very long. In 1887, he bought a farm in Columbus Township, Anoka County. No mention is made of Michael in Anoka County. In Conny's words; "About the Kumshers in Iowa: Here I've found so far only the Kumschier Michael, who went to America in 1884. He was the founder of Kumsher family there. But I'm lacking data of four sisters of Michael Kumschier and a stepbrother. Overall, Michael Kumschier had 6 sisters and 3 brothers. Of these, two sisters and one brother from the second marriage. Otherwise, there are very many families Kumschier in Bohemia (now Germany) and some in other countries." 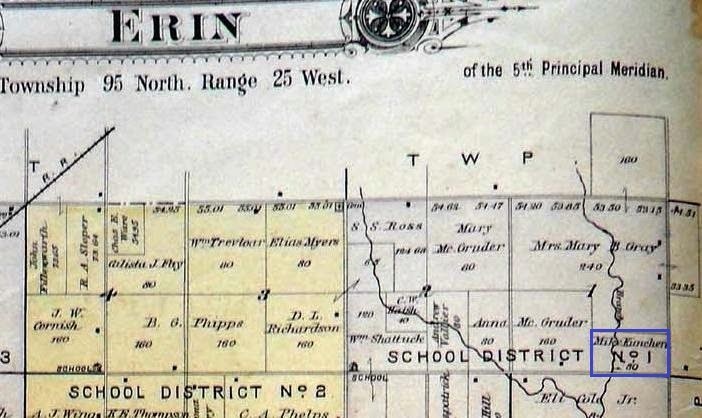 The first document we have located about Michael is his listing in 1896, on the map of Erin Township, Hancock County, Iowa. His last name is spelled Kunchere. Michael is single and farming at the time of the 1900 Federal Census. He gives is arrival date as 1884 and his birth date as May 27, 1869. He is a naturalized citizen, and gives his country of origin as Germany. We don't know why he didn't say Bohemia. We do know that in the year of the 1900 Federal Census, at age 30, Michael was married to a young Czech woman. 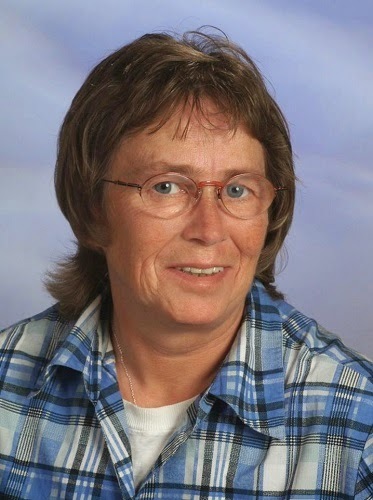 Her name was Stella Cipera and she was born and raised in the village of Protivin, Howard County, Iowa. Protivin was founded primarily by Czech immigrants who named the town after one of the same name in their native area of Bohemia, now the Czech Republic. 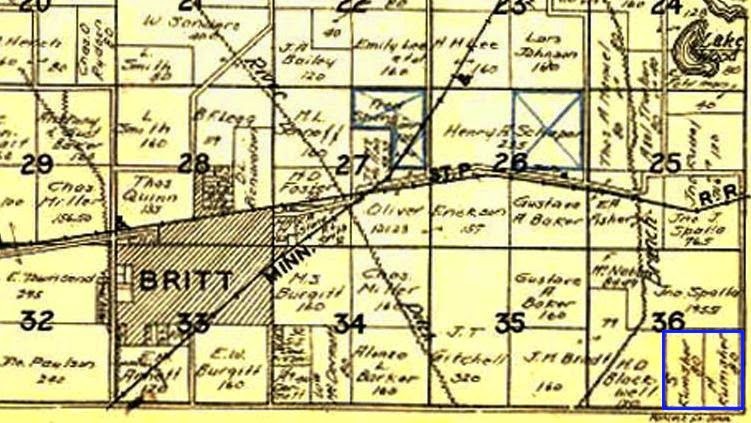 Britt Township, Hancock County, 1930 - Mike and Stella Kumsher have added 80 acres to their orignal 80 acre farm. The 2nd 80 may be in Stella's name. When Clara L. Kumsher was born on May 18, 1903, in Erin Township, Iowa, her father, Michael, was 33 and her mother, Stella, was 20. She married Floyd Loy on March 6, 1924, in Britt, Iowa. They had two children during their marriage. She died in September 1986 in Britt, Iowa, at the age of 83, and was buried there in St. Patrick's Catholic Cemetery. When Ann E. Kumsher was born on January 2, 1905, in Erin Township, Iowa, her father, Michael, was 35 and her mother, Stella, was 22. Ann moved to Chicago where she lived and worked. She died on February 27, 1989, at the age of 84, and was buried in St. Patrick's Catholic Cemetery. When Edward Charles Kumsher was born on November 24, 1906, in Erin Township, Iowa, his father, Michael, was 37 and his mother, Stella, was 24. He married Eva M. Gatchel on February 14, 1933, in his hometown. They had six children during their marriage. He died on January 27, 1993, in Britt, Iowa, at the age of 86, and was buried there in St. Patrick's Catholic Cemetery. When Teressa Adeline Kumsher was born on September 12, 1911, in Erin Township, Iowa, her father, Michael, was 41 and her mother, Stella, was 28. She married Lloyd Anderson on May 3, 1932, in Burt, Iowa. They had one child during their marriage. She died on November 11, 2011, in Mason City, Iowa, at the age of 100, and was buried in St. Patrick's Catholic Cemetery. 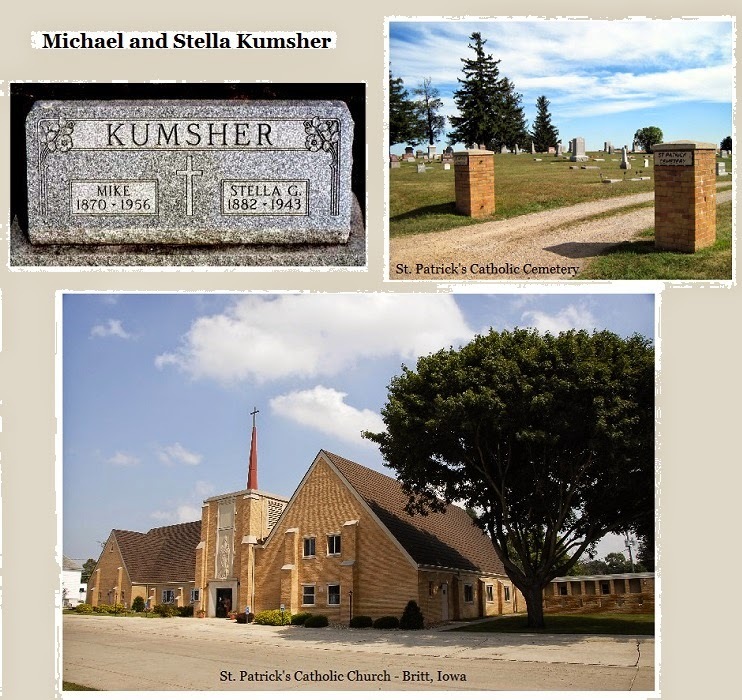 When Michael G. Kumsher was born on October 3, 1915, in Erin Township, Iowa, his father, Michael, was 46 and his mother, Stella, was 33. He married Agnes M. Ptacek on November 22, 1938, in Hancock, Iowa. They had seven children during their marriage. Michael and Agnes were on the family farm until they moved into Britt in 1996. He died on November 27, 2007, in his hometown, at the age of 92, and was buried there in St. Patrick's Catholic Cemetery. "Funeral arrangements are incomplete at the Boughton Funeral Home for Michael Kumsher. Mr. Kumsher 86, a retired farmer of the Britt vicinity, was found dead at his home Monday by his daughter, Clara Loy, Chicago, and his granddaughter, Mrs. John Steenlage, Britt. (The obituary is incomplete) [He is survived by] two sons, Edward Charles of Kanawha, and Michael, Jr. of Britt; and one brother, Charles, of St. Paul, Minnesota; 14 grandchildren and five great grandchildren." This is the first connection we have to his brother Charles. We will take a look at Charles and his family in the next blog. Michael's descendants continue to live in Iowa. With Conny's help, the research continues.